EFT, Emotional Freedom Techniques, is a wonderful energy psychology tool that often works when nothing else does. It is an emotional version of acupuncture but there are no needles involved–it is totally non-invasive, gentle, portable and can be learned by anyone, even children. 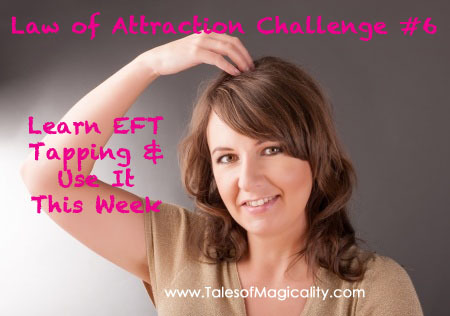 What you are doing with EFT is mentally tuning into specific issues such as pain or memories that evoke negative emotions, and then stimulating certain energy meridian points on the body by tapping on them with your fingertips. Our bodies are “electrical” in nature, and just like the wiring in your house, our bodies have circuits that energy flows through. Have you ever plugged too many things into one outlet and blown a fuse then had to go to the electrical panel and flip the breaker back? Well, the circuits in our bodies can get overwhelmed too, preventing the smooth flow of energy–essentially causing a blown fuse. Those headaches you always get that interfere with your daily life, the intense sensation of butterflies in your stomach anytime you have to speak to a group of people, the anger you always feel and don’t know why–these can all be the result of a disruption in your energy system. EFT is what we use to “flip the breaker” on our preverbal “blown fuses”–it’s like a Do-Over switch…it’s magical and I am in love with it! Please check out the Youtube video included here to learn the basics of tapping–you will be surprised how quickly you can learn how to use it! After becoming familiar with tapping, try to use it this week! It is your Law of Attraction Challenge this week! Try it for anything! Try tapping before you go to bed, when things are quiet and you can take a few minutes for yourself. Please let us know how it goes for you and about your results! Here’s to Tap, Tap, Tapping!